The Ministry of Foreign Affairs has issued a bilingual Notice on Handling PRC Visa Applications spelling out China’s new visa categories. Previous law: F visas were issued to persons invited to give lectures or for official visits; for purposes of business, scientific, technological, or cultural exchanges; or for short-term studies or internships lasting less than six months. Persons coming for “business or commerce” will now apply for M visas instead of F visas. Persons coming for short-term studies will now apply for X2 visas rather than F visas. Certain high-level talents and professionals urgently needed by China will instead apply for R visas. MFA notice: The key supporting document is an invitation letter issued by a relevant entity or individual in China. The invitation should contain information on the applicant (full name, gender, date of birth, etc. ), the visit (purpose, arrival and departure dates, places to be visited, relations between the applicant and the inviting entity or individual, source of financial support), and the inviting entity or individual (name, contact telephone number, address, official stamp, signature of the legal representative or the inviting individual). Examples of proper activities for an F visa include summer camps and government-to-government visits. Applicants will need further guidance from the government about how to distinguish proper activities for F versus M visas. F visas no longer explicitly authorize internships. See Q&A on China’s New Exit-Entry Administration Law and Regulations. Neither F nor M visa explicitly authorizes training. The term 考察, which I’ve translated above as “inspections” is translated by MFA as “study tours.” It could refer to various types of visits for purposes of inspection, learning, or investigating. Previous law: J-1 visas issued to foreign correspondents residing in China; J-2 visas issued to foreign correspondents making short trips to China to gather and report news. New statute/regulations: J-1 visas will be issued to foreign correspondents residing in China for in excess of 180 days for purposes of work work with foreign news organizations resident in China; J-2 visas will be issued to foreign correspondents who make short trips to China not exceeding 180 days to gather and report news. J1 and J2 visa applicants should present a Visa Notification Letter issued by the Information Department of the MFA and an official letter issued by the media organization for which the journalist works. Applicants should contact the press section of the Chinese Embassy/Consulate General in advance to complete relevant formalities. Within 30 days of entry, J1 visa holders will need to apply for residence permits. Analysis: Visas for journalists will continue to be subject to potential delay and may be impacted by political factors. See Wall Street Journal Editorial Proposes Denying Visas to Chinese Journalists. Previous law: L visas were issued for tourism, to visit relatives, or for other private purposes. Now, L visas are exclusively for tourism. The draft State Council regulations would have required that round-trip airlines tickets (往返机票) and hotel reservations (酒店订单) be provided in every case, but that requirement was dropped in the final regulations. Persons coming to China to visit relatives or for other private purposes will now apply for Q or S visas. 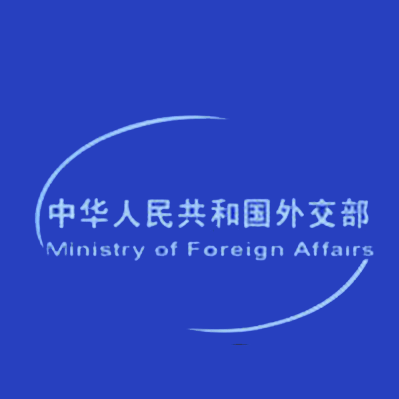 MFA notice: Applicants must submit either their travel itinerary, including round-trip air reservations (往返机票订单), hotel reservations, “etc.” or an invitation letter issued by an entity or individual in China identifying the applicant (full name, gender, date of birth, etc. ), describing the planned visit (arrival and departure dates, places to be visited, etc. ), and identifying the entity or individual providing the invitation (name, contact telephone number, address, the entity’s official stamp, signature of the legal representative of the entity or the individual). Analysis: Thankfully the MFA notice is not as strict as the draft regulations. Round-trip airlines reservations, rather than actual tickets, should normally be sufficient. Still, a consular officer has the authority to require this on a case-by-case basis. Previous law: There was no prior M visa classification. F visas covered visitors for business or commerce. New statute/regulations: M visas will be issued to persons who come for business or commercial activities. Key evidence includes an invitation letter issued by a Mainland China trading or business partner. invitation letter issued by an entity or individual, with information about the applicant (full name, gender, date of birth, etc. ), the planned visit (purpose of visit, arrival and departure dates, places to be visited, relationship between the applicant and the inviting entity or individual, source of financial support for the trip), and the entity or individual providing the invitation (name, contact telephone number, address, entity’s official stamp, signature of the entity’s legal representative or the individual). Examples of proper activities with an M visa include negotiating a business contract, purchasing equipment, and attending a trade fair. Although not explicitly reflected in the MFA notice, the intent of the new Exit-Entry Administration Law is to draw a clearer line between permitted business and commercial activities with an M visa and prohibited employment. See generally Q&A on China’s New Exit-Entry Administration Law and Regulations. Prior practice was for consulates to accept either an invitation letter from an entity like a company or an invitation letter from a “duly authorized unit” of government (被授权单位), such as a local bureau of human resources and social security. The latter were often helpful in obtaining multiple entry visas valid for longer stays in China. It’s unclear whether omission of these letters from the MFA announcement was intended to show they’ve fallen into disfavor. Previous law: L visas were granted to persons coming to China to visit or reside with PRC citizen or permanent resident family. New statute/regulations: Q1 visas are for family members (家庭成员), either of Chinese citizens or of permanent residents, who applying to enter and reside (in excess of 180 days) in China for purposes of family reunion. Key evidence includes an invitation letter from and proof of relationship to the Chinese party. Q1 visa holders must apply to the Public Security Bureau for a residence permit within 30 days of entering China. The MFA notice defines which “family members” may qualify for Q1 visas: spouses, parents, sons and daughters, spouses of sons or daughters, siblings, grandparents, grandsons and granddaughters, and parents-in-law. An invitation letter issued by a Chinese citizen or permanent residence permit who lives in China, including information about the applicant (full name, gender, date of birth, etc. ), the visit (purpose of visit, intended arrival date, places of intended residence, intended duration of residence, arrival and departure dates, relations between the applicant and the inviting entity or individual, source of financial support), and information about the inviting individual (name, contact telephone number, address, and signature). The MFA notice mistranslates the Chinese–no official stamp or signature of a legal representative is required. Photocopy of the PRC citizen’s national ID or permanent resident’s passport and permanent resident card. Original and photocopy of the evidence of relationship between the parties (marriage certificate, birth certificate, certification of kinship issued by Public Security Bureau or notarized certification of kinship). New statute/regulations: Q2 visas are available for relatives of PRC citizens or permanent residents coming to China for visits not exceeding 180 days. Q2 visa applicants, coming for short-term visits, may be invited by any relative–not just the specified family members who may be invited to reside in China with a Q1 visa. Previous law: “Talent” visas are a new classification that did not exist under prior law. In the past, persons coming to China for work generally held Z visas. New statute/regulations: R visas will be issued to foreign high-level talents that China needs as well as to specialized talents that are urgently needed due to short supply. Key evidence includes a letter from a responsible government department. MFA Notice: No further details. Analysis: Before R visas can be issued, further rules will need to be issued–probably by the State Bureau of Foreign Expert Affairs–to define their requirements and procedures. In the meantime, foreign experts will continue to apply for Z work visas under current rules. Previous law: Persons coming to China to visit family members with X foreign student visas were issued L visas but not residence permits. Persons coming to China to visit family members with Z visas were issued Z visas and residence permits. S1 visas are for long-term family visits (in excess of 180 days) by a spouse, parent, child under age 18, or parent-in-law of a foreign national “residing” in China for work or study. S1 visa holders must apply to the Public Security Bureau for a residence permit within 30 days of entering China. S2 visas will are for short-term visits (not exceeding 180 days) by family members (家庭成员) of foreign nationals “staying” in China for work or study. Key evidence for an S1 or S2 visa includes an invitation letter and proof of relationship to the foreign national in China. an invitation letter from the foreign national in China with information about the applicant (full name, gender, date of birth, etc. ), the visit (purpose of visit, arrival and departure dates, place of intended residence, relationship between the parties, source of financial support, etc. ), and the inviting relative (name, contact number, address, signature, etc.). a photocopy of the inviting individual’s passport and residence permit. an invitation letter from the foreign national in China with information about the applicant (full name, gender, date of birth, etc. ), the visit (purpose of visit, arrival and departure dates, places to be visited, relationship between the parties, source of financial support, etc. ), and the inviting relative (name, contact number, address, signature, etc.). Analysis: It’s good news that X student visa holders relatives qualify for residence permits, unlike under the previous law. Previous law: Issued to students and others coming to China for training or internship for a period of six months or more. X2 visas will be issued to persons applying for short-term study (up to 180 days) in China. For X1s, key evidence is the school’s admission letter and the Ministry of Education Form JW201 or JW202 (Visa Application for Study in China). The difference between these forms is that JW201 is for self-supporting students and JW202 is for scholarship students. For X2s, just the school’s admission letter is required. Previous law: Z visas were issued to foreign workers and their accompanying family members. Workers continue to apply for Z visas. Workers’ family members will apply for S visas. MFA Notice: No change from previous law regarding key documents to be presented. Also, no change in the requirement that Z visa holders must apply for residence within 30 days of entry. Analysis: Generally speaking, the impact of the new law has yet to be felt. Under the new law, various departments should cooperatively formulate and periodically adjust a guidance list regarding foreigners’ work in China. The list should be based on economic and social development needs, as well as the supply of and demand for human resources. No such list has been published yet. This is not entirely new. Existing rules require that Z visas be reserved for positions for which the employer has a “special need” and that is currently a “shortage” occupation in China. These rules are fairly vague and unevenly enforced. It remains to be seen how the new law will be interpreted and enforced. Consular officers retain the authority to require additional documents below those mentioned above, to decide on the validity/stay/number of entries of any visa issued, and to refuse a visa without explaining why. What is new to M visas that wasn’t previously covered by F’s? Is F for NGO’s? What visa is right for someone who works purely on the internet, no boss, and paid via PayPal? Dear S: Basically, M visas for business and commerce have been carved out from the F category. So there’s no “new” activities that can be done with an M visa that couldn’t be done previously with an F.
You ask if NGO’s could use the F visa. That’s a good example–an NGO could send staff to China for scientific-technological, education, cultural exchanges, health or sports activities, etc. that apparently fit within the parameters of the F visa. And as to what visa is right for someone who is self-employed, it depends what the purpose of the China visit is. For example, an L for tourism, an F for an exchange, or an M for business meetings. I want to apply for family visum (L-visum) for my partner/girlfriend which will join me soon in Shanghai. Now, the regulations mention that this visum can be obtained if we are either married or are ‘living partners’. The latter is what we want to apply through. In our countries (both from Europe), we have such thing as registered partnership, do you know if this will be accepted as ‘living partners’ according the new legislation? If so, will a Chinese translation of this document validate it for the Public Security Bureau in Shanghai? 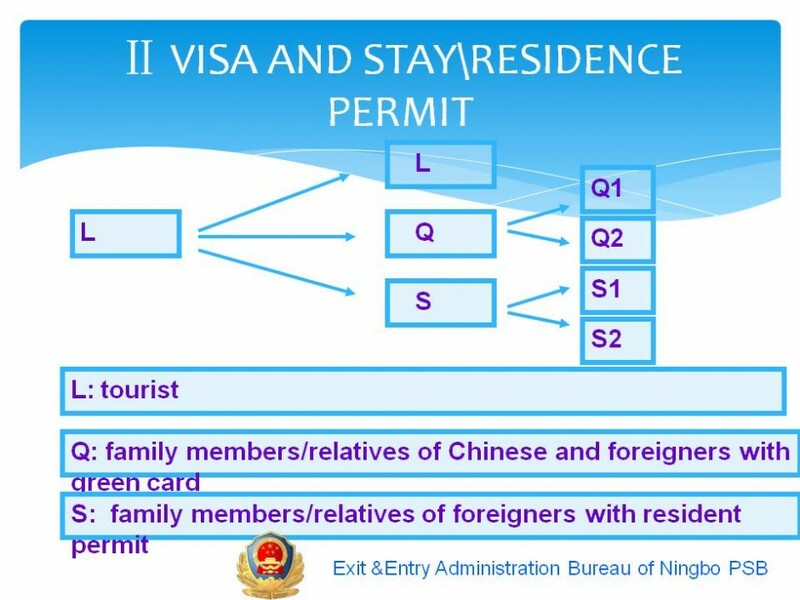 S1 visas are for long-term visits (in excess of 180 days) either (a) with a “spouse” (or certain other relatives) of a foreign national residing in China for work or study or (b) for “private affairs.” S1 visa holders must apply to the Public Security Bureau for a residence permit within 30 days of entering China. The term “private affairs” hasn’t been defined in the new regulations but in the past has sometimes been interpreted as including medical treatment and visiting an unmarried partner or even friend. My point is that an S1 or S2 visa may be available to visit or reside with an unmarried partner under the rubric of “private affairs.” But there’s no national definition of private affairs or of what documents are needed to prove an unmarried partnership, at least yet. I’ve heard that recently the Shanghai PSB has stopped issuing residence permits on the basis of an unmarried partnership, but it’s not clear whether this change is temporary or permanent. Other options may exist too, such as obtaining an L visa for tourism, but extensions would be limited and no residence permit would be possible. I’ve been married to a Chinese citizen and living in China for more than 5 years. I would like to inquire about Q1 and Q2 visas. I’m curious how the government will evaluate whether I have sufficient financial support to qualify for the visa because in recent years living in China with a visa issued on the basis of my marriage (previously called an L visa), I haven’t been able to work. Do I need proof of my own finances or my husband’s? How much? Let me just be sure I understand the facts: Are you asking about applying for a “visa” at a Chinese consulate outside of Mainland China? (The Ministry of Foreign Affairs notice applies to such applications). Or are you asking about applying to the Public Security Bureau’s Exit-Entry Division within Mainland China? (This notice does not apply). Hi Veron, I am also married with a Chinese citizen and have been living 6 years in Nanning, China. Although this post is about visas issued by PRC Consulates abroad, on a closely related point, the Public Security Bureau can issue family reunion residence permits for spouses of PRC citizens in China. The application form does not asking anything about financial support. It is a similar procedure as beforas the new law, except that I was asked to provide a health certificate from a hospital designated by the PSB. Thats all! I’ve got a residence permit valid for 2 years because my wife’s hukous was issued in the same city where I applyed for the residence permit. Good luck! Dear Mr Chodorow, I am married with a Chinese citizen and have been living in China without interruption since April 2007. Up to now, I’ve been issued L visas valid for one year each. The current one was issued October 2012. How do I need to manage it with the new laws?? Thanks. First, let’s get our terminology straight. Who issued the stamp in your passport that you referred to as a visa? Was it a PRC Consulate abroad? If so, then you’ve commented on the right page, which is about the requirements and procedures for “visas” (签证) issued by PRC Consulates, which are part of the Ministry of Foreign Affairs. But if the stamp was issued by a Public Security Bureau’s Entry-Exit Division, then it’s probably not a “visa” but instead a residence permit (居留许可). I’m going to assume–unless you tell me otherwise–that you’ve got a residence permit. The Ministry of Public Security should issue instructions, either public or confidential, to Exit-Entry Divisions about what to do post-September 1, 2013. To my knowledge, no such instructions have been issued, so the best way to get specific instructions is to visit the website or the actual office of the Exit-Entry Division in your city, unless you want to hire a law firm like us to do it for you. You’ll be applying for a residence certificate for family reunion, issued to foreigners who need to reside in China for purposes of family reunion with relatives who are Chinese citizens or permanent residents. These certificates are valid for 180 days to five years, under the new law. So it’s possible you’ll get a certificate valid for longer than 1 year. We’ve been seeing 2-year residence certificates for family reunion issued. Under the new law, to extend one’s residence period, a person should apply 30 days before the prior residence certificate expires. The statute and regulations are silent as to the consequences of filing late, and so far the Exit-Entry Divisions don’t seem to be strict about this. Check with your local Exit-Entry Division to see what documents are being required. This answer draws on info found in my FAQ on the new law and regulations, https://lawandborder.com/faq-new-visa-law-and-regulations/. Thank you very much for fast and precise answer. My most recent stamp is an L Visa valid for one year issued by PSB in Nanning, where I live. I will go there today to get confirmation of your information, but I think you’re right! I will tell you in the next days the result. Regards, Roger. Hi again! You were right, Mr Chodorow. The PSB in Nanning said that since I’m married to a Chinese citizen I qualify for a family reunion residence permit valid for 2 years since my wife’s hukou was issued in the same city where I applied for the permit. As I mentioned to Veron above, the procedure is similar to what it was under the old law, except that I had to provide a health certificate from a hospital specified by PSB. It’s unclear if I’ll need another health certificate in 2 years when I renew my permit. Thanks for having taking time to answer. Regards, Roger. Hi: I just got turned down for a tourist visa. They said it was because I have three visas from some time ago in my passport so I now need an invitation letter from a resident in China. Hotel bookings are not enough anymore. They said its part of the new rules. Anybody heard about this? Its kinda crazy idea, basically they are saying, oh you have been too often too china please don’t come anymore? As mentioned above, applicants must normally submit either (a) their travel itinerary, including round-trip air reservations (往返机票订单), hotel reservations, “etc.” or (b) an invitation letter issued by an entity or individual in China identifying the applicant (full name, gender, date of birth, etc. ), describing the planned visit (arrival and departure dates, places to be visited, etc. ), and identifying the entity or individual providing the invitation (name, contact telephone number, address, the entity’s official stamp, signature of the legal representative of the entity or the individual). However, consular officers have the authority to request additional information in support of a visa application. Perhaps you indicated in your last visa application form or during an interview that you planned to visit an individual in China, and that triggered the request for an invitation letter. And perhaps due to your multiple prior visits the consular officer seeks additional evidence that your real purpose for coming to China is for a visit, not for employment, studies, etc. I’m in Hong Kong. Just came back from the China visa office. I’m planning to stay in my dad’s home in Shanghai and they need proof of my residency. What kind of proof is this? I’m guessing that you’re applying for an L (tourist) visa. (Let me know if I’ve guessed wrong). As mentioned above, you’ll need either “proof of a hotel reservation” or “an invitation letter issued by a relevant entity or individual in China” containing the details listed above. This is only my best guess since I wasn’t with you at the Office of the Commissioner of the Ministry of Foreign Affairs in HK to hear what the officer wants. I am applying for S2 visa in the US to visit my brother in China . I have searched but have not been able to find what is an acceptable proof of kinship. What is acceptable at the Chinese consulate? How should it be notarized. Thank you for your reply. A certified copy is a one with a signed statement that it is a true copy of the “original.” (It does not certify that the original is genuine, only that it is a true copy). In the case of vital records, the original is kept in the government office, and the certification should be by the custodian of the record. You can directly contact the vital records agency for your state. Check this website for a state-by-state list: http://www.cdc.gov/nchs/w2w.htm. No notarization or authentication is needed for purposes of the S2 visa application at a PRC Consulate abroad. If, however, you may have use for the birth certificates in China (e.g., extending your S2 visa), then you may want to consider getting the birth certificates authenticated. Thank you for the detailed and quick reply! This was very helpful. I am currently working in China on a Z visa to teach English and wish to have my long-term partner come to join me. Last semester, she arrived on a tourist L visa and was able to enroll in a language program at a university for the semester. She returned home for the break and wishes to come back to China, but this time, her tourist visa was denied. What other options might we have to be together this coming semester?